It’s finally spring and it’s only May. We still have plenty of theater openings and I’m reviewing some films too. Here are a few of the current storefront stage offerings, providing perspectives on historical events. They’re all interesting for various reasons, even when they’re not four-star productions. 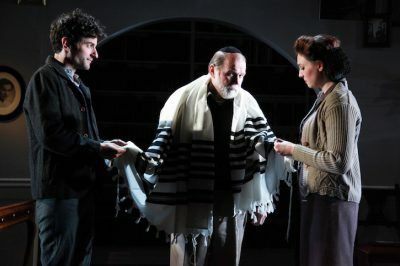 The rabbi (Craig Spidle) with two survivors. This is the emotional story of Polish Holocaust survivors in 1947 San Francisco. They were able to survive the death camps by doing what was necessary and now live with survivors’ guilt and other traumas. The play revolves around a rabbi, who was a freedom fighter in Poland, and now meets with survivors to help them deal with their memories and to persuade the local Jewish community that those memories should not be forgotten. The rabbi is forcefully played by Craig Spidle, a veteran Chicago actor. This play is beautifully staged, with fine directing and acting. It’s two-plus hours of good theater, except the script really goes too far in trying to include some bizarre and unlikely events. My review makes clear that the production wasn’t able to overcome the flaws in the plotline. 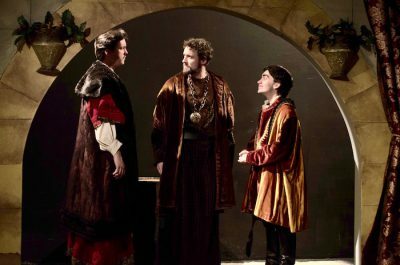 Promethean’s minimalist production of the James Goldman play about Henry II, his three sons, and Queen Eleanor of Aquitaine, may sound familiar. It’s best known as the 1968 film starring Peter O’Toole and Katherine Hepburn as the royal pair. The dialogue is lively and witty and the plot hits contemporary notes, as well as reminding us of the Shakespearean dilemma where a king must divide up his property among three siblings. A fine production by a small theater company. My review. This play by Matei Visniec is a great example of Trap Door’s serious and slyly bizarre productions that pick at the nonsensical scabs of politics and contemporary thought. The staging makes use of colorful, angular perspectives and highly physical performances to make this a delightful 75 minutes of theater. Set in 1953 before Stalin’s death, the famous writer Yuri Petrovski (who always is called by his full name, as in Russian literature) arrives at a mental hospital with the goal of using his stories to educate the mental patients about the glories of Communism. The story is played out in a ses\ries of scenarios that fall far short of being a linear storyline. No matter; you’re seeing a brilliant critique of Communism by a Romanian dissident who has lived most of his life as political refugee in France. The play closed April 30. Bloody Haymarket is a new production that portrays the dramatic events of May 1886, when speakers at a May Day rally in Haymarket Square demanded an eight-hour day and an end to the concentration of wealth in a few hands. A bomb went off during the rally and eight policemen were killed. Eight of the speakers were arrested and four of them were executed by hanging. The issues, of course, resonate today. The production dramatizes the participants, their stories, trial and public reaction with a cast of 21. I recommend this to you if you’re particularly interested in the Haymarket history, but I can’t recommend the quality of the production. Performances are on Saturday nights thru May 28. For more info, listen to Third Coast Rewind, the first of our new podcast series, featuring interviews with the actors and creative team for Bloody Haymarket.